People get depressed when they turn a year older, and they're still single because they feel they're doomed to be lonely. But, let me tell you---you're cool! You earn your own money, and you can spend it anyway you want without having someone to answer to. No parents to interrogate you, no spouse or children yet to consider. No curfew. No one to tell you what time you need to be home, or what time you should be waking up. You sleep whenever you wish. You make your own decisions, no matter how big or trivial it may be. Your parents can give you advice and you may ask your friends' opinion, but it's still your call. Again, no one to answer to but yourself. You're more comfortable now in your own skin. No more awkward and confusing moments. You change hairstyles and don't give a damn what people might say as long as it looks good in your opinion. You choose clothes that are comfortable (and stylish) to wear, not the clothes your parents chose for you or what your crowd is wearing. You can speak your mind, and you're not scared to be misjudged. You no longer worry about what people might think about your opinions or if they will take it against you. You don’t put up with other people’s crap anymore. If it doesn’t make you happy, earn money or grow, you can simply leave it. Your time is valuable enough to spend on meaningless things or people who don’t nourish you. The freedom to watch adult films, go to places exclusive for adults and not faking your age, feeling guilty or mortified about it. You met almost all kinds of people, you’ve heard a lot of crazy crap, you’ve been through hell and back that you feel as though you can take anything life will throw at you. You are stronger, wiser and more confident than you were back when you were at your 20’s. You’re definitely richer now than you were before. Wealthier in terms of money (that is if you have saved and invested well enough years before), healthier (if you’ve been taking care of your body) and wealthier in experience and friends. You understand and appreciate the essence of compounding interest. You used to hear Greek whenever you come across that word and when someone tries to explain it to you. Now, you feel a natural connection with that phrase, and you know that it’s a friend not a foe if you know how to use it. It’s never too late to be what you want to be because now you have the resources and the time in the world to pursue your long overdue dream. You are your own priority now. You know which battles to pick; which ones you need to continue fighting, surrender or ignore. You have a blank canvass of life. Though you’re in your mid-life now, you still can have a brand new start. 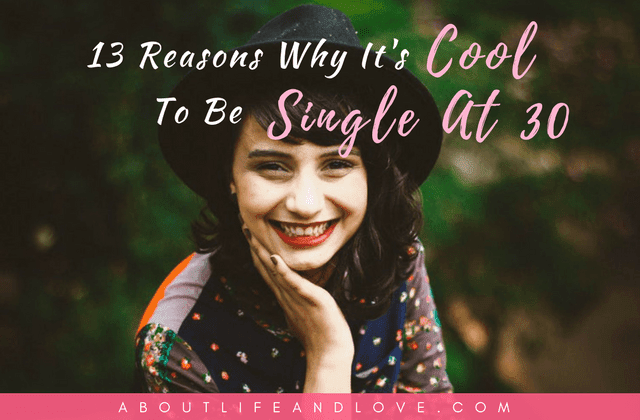 30 and still single? Hey, you're cool! Fellow 30-ish single. Totally feel you on this post!